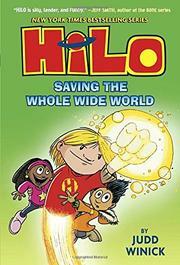 Hilo, D.J., and Gina have reunited to save the world from more impending robot invasions. It starts with just a toe—Hilo's toe, specifically. Diving right in where series opener Hilo (2015) ended, the story begins with Hilo blasted to a Void to keep the Earth safe from the human-hating, destruction-driven robot Razorwark. However, his toe (through which he can talk) remains with D.J. Soon, a portal opens, and to the elation of Gina and D.J., out pops Hilo (albeit in pieces that fuse themselves back together). The trio discovers that other creatures are also able to use the portal, and soon their quiet town is teeming with bowling-ball–wielding robots and virulent vegetables that threaten to overwhelm their entire village. Hilo's lost memories are also slowly returning, and he learns that he may have some commonalities with his enemy. This connection is only merely teased at, leaving room for further development in the next installment. Winick's worldbuilding is adroit and exciting; he blends humor, friendship, and robots with equal ease within lively and evocative panels. Vigorous diversity is its hallmark: D.J. is Asian-American, Gina is African-American, and Hilo’s a white “highly advanced android from a futuristic dimension.” Polly the cat-shaped samurai “apprentice sorceress third class” is an excellent new character.